If, like me, life frightens the hell out of you, perhaps you’d benefit from knowing that Maya Angelou and Jean-Michel Basquiat made a children’s book that summoned demons forward before yelling at them “LIFE DOESN’T FRIGHTEN ME AT ALL”. 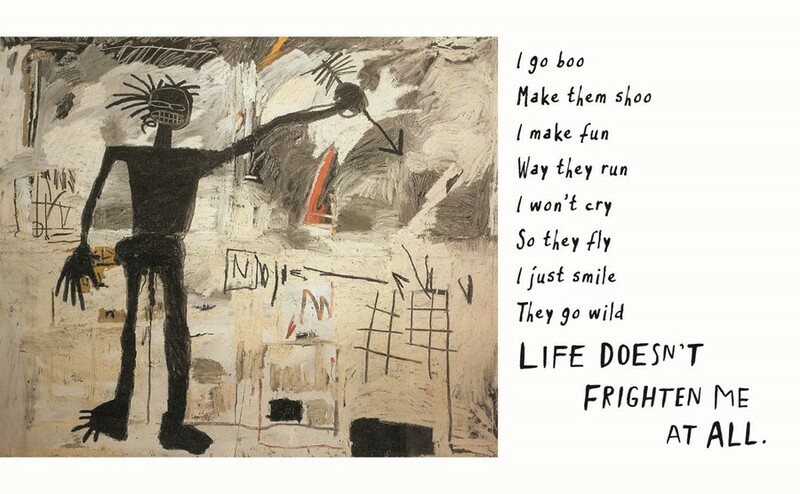 Originally released in 1993, the aptly titled Life Doesn’t Frighten Me combines a poem written by Angelou with art made by Basquiat to create a “brave, defiant” tale that “celebrates the courage within each of us, young and old”. For the 25th anniversary of its original publishing date, Life Doesn’t Frighten Me has been re-released by Abrams Books. While Angelou claimed that she wrote the poem “for all children who whistle in the dark and who refuse to admit that they’re frightened out of their wits”, its staying power over the past two-and-a-half decades proves it’s certainly relevant for any age. For added vibes, listen to Angelou read the book below.